Reel Talk Online: Quentin Tarantino Creates a Sleek Slavery Drama in the First Trailer for "Django Unchained"
Quentin Tarantino Creates a Sleek Slavery Drama in the First Trailer for "Django Unchained"
Nothing says the holidays like a good old-fashioned slave comedy. Writer/director Quentin Tarantino, who once flipped the story of World War II on its ear in Inglorious Basterds, returns for another era-bender with Django Unchained. Set in the South two years before the Civil War, “Django Unchained” stars Academy Award-winner Jamie Foxx as Django, a slave whose brutal history with his former owners lands him face-to-face with German-born bounty hunter Dr. King Schultz (Academy Award-winner Christoph Waltz). Schultz is on the trail of the murderous Brittle brothers, and only Django can lead him to his bounty. The unorthodox Schultz acquires Django with a promise to free him upon the capture of the Brittles – dead or alive. Success leads Schultz to free Django, though the two men choose not to go their separate ways. Instead, Schultz seeks out the South’s most wanted criminals with Django by his side. Honing vital hunting skills, Django remains focused on one goal: finding and rescuing Broomhilda (Kerry Washington), the wife he lost to the slave trade long ago. Written and directed by Academy Award-winner Quentin Tarantino, DJANGO UNCHAINED is produced by Stacey Sher, Pilar Savone and Reginald Hudlin. The executive producers are Harvey and Bob Weinstein, Michael Shamberg, Shannon McIntosh, and James Skotchdopole. DJANGO UNCHAINED will be released in the U.S. on December 25, 2012, and internationally by Sony Pictures Releasing International. In case you haven't already heard, this has been one of the most talked about movie releases of 2012. 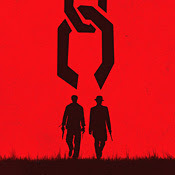 True to Tarantino form, the trailer looks slick and cool as all get out. Tackling a controversial subject and putting a spin on a much heated era in history, Tarantino assembled major Hollywood heavyweights, including DiCaprio (in his first villainous onscreen role) and hugely underrated actress Kerry Washington, while also aiming to resurrect the career of Don Johnson (John Travolta-style, I imagine). If anyone can do it, I bet Tarantino can. Not to mention, Tarantino and Samuel L. Jackson go together like biscuits and gravy. It will be interesting to see how Foxx does in a role like this (which, in looking at the trailer, seems to fit him like a glove), as well as Kurt Russell, whose career has been aggressively uneven, but respected. Thoughts on the trailer? Django Unchained is in theaters December 25th. I don't love Tarainto, and I'm not too fond of Foxx. But, I do love DiCaprio (I've cooled on him slightly since 2010, but I still like him) and I'm so ready for Kerry to find the love she deserves on the big screen. Will this finally be that *breakout* performance I've been waiting for since SAVE THE LAST DANCE? This is what I said on another site.